What: A family-friendly street party and the Good Neighbor Awards. When: May 19, 2012 from 1-4 p.m. 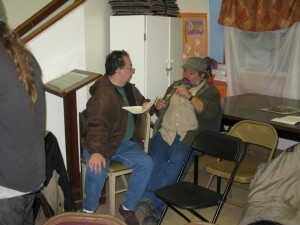 Occupy Bernal is proud to have helped prevent the evictions of some of our neighbors! To show appreciation for the hard work and perseverance of Bernal locals, we’re throwing a “foreclosure fighter” fiesta. – see Occupy Bernal instigator Beth Stephens and artist/activist Annie Sprinkle hand out the awards to neighbors whose homes are in foreclosure and who are fighting to stop predatory bank practices. Tell Wells Fargo: Hands Off Our Neighbors! Call/Email Day Monday! Despite recording record profits last year, Wells Fargo continues to drive tens of thousands of people out of their homes through foreclosure proceedings while devastating our communities. The good news is, we’re fighting back. Occupy Bernal Heights formed to resist the foreclosure and eviction of our neighbors. Through public protest, we stopped the bank from immediately auctioning off the homes of Washington and Maria Davila and Alberto Del Rio, but the bank has merely rescheduled the auction dates. And despite meeting with six foreclosure fighters from the neighborhood and another from Bayview-Hunters Point, Wells Fargo executives have refused to allow any of them to refinance their homes or modify their loans, and have not stopped foreclosure proceedings against them. Call and email Wells Fargo board of directors TODAY and demand that they grant a loan modification and fair deal to Alberto Del Rio; Maria and Washington Davila; Thomas German; Ernesto Viscara; Victor Granados; DeDe Martinez; Archbishop King; Eric Lundgren and Ross Rhodes. Tell them to stop evicting and foreclosing on our neighbors! Subject: WELLS FARGO: HANDS OFF OUR NEIGHBORS! You control Wells Fargo either directly or on behalf of its borrowers and your stockholders. I demand that you cancel the auction of Alberto Del Rio (Loan #47339080) and Maria and Washington Davila’s family homes immediately. I also demand that you allow them, along with Thomas German (Loan #44751501); Ernesto Viscara (Loan # 46110532); Victor Granados (Loan #5000039031); DeDe Martinez (Loan #0046809208); Archbishop Franzo King; Eric Lundgren and Ross Rhodes, to modify their loans with you or refinance their homes. I call on you to stop evictions and foreclosures in San Francisco. I also demand you direct Wells Fargo to meet with Occupy Bernal, SFHDC and ACCE to end and redress your predatory lending practices, and those of your purchased affiliates, by instituting a moratorium on foreclosures, and having your CEO meet with our neighbors who are in immediate risk of losing their homes as a result of Wells foreclosures. Stop evicting and foreclosing on our neighbors! 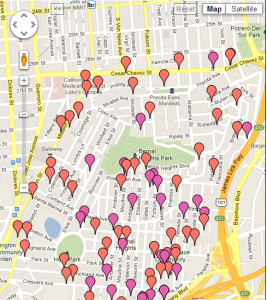 Occupy Bernal has identified 84 homes in foreclosure proceedings in Bernal Heights alone. Of these, Wells Fargo owns the mortgage in at least 13 of these cases. Of the homes we have visited, a disproportionate number of the owners are African-American or Latino, reflecting the racist practices of the banks who are preying on communities. 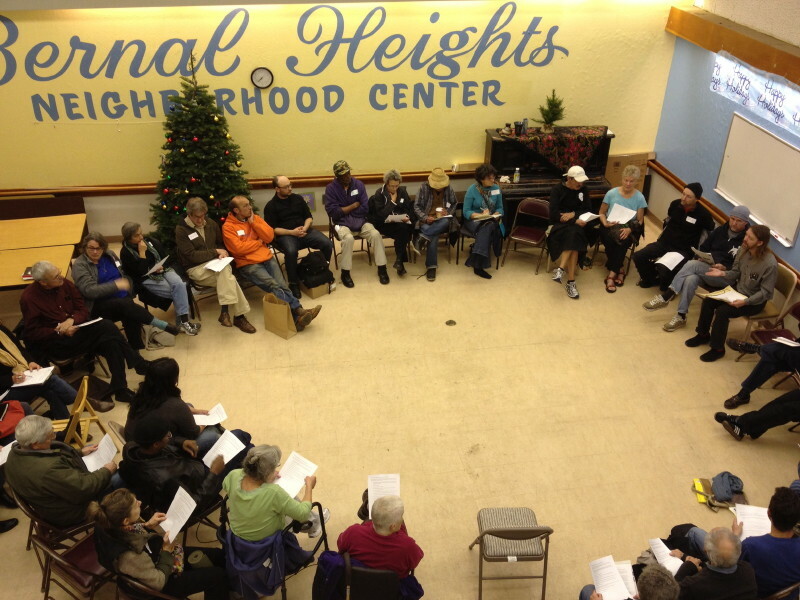 While foreclosures in Bernal Heights represent just the tip of the iceberg in a city that has seen as many as 12,000 foreclosures in the past three years, Occupy Bernal is hopeful that a victory in our neighborhood could spark victories elsewhere in San Francisco. Thomas German is a seventy-two year-old veteran and retired worker from the US Mint in SF. Has lived in Bernal since 1967 and at his home at 248 Andover since 1974. Thomas is known and loved by all on his street. He was the first Bernal resident to step forward and join OB to battle to keep his home. Melodie “ DeDe” Martinez is a third generation resident of 150 Elsie St. 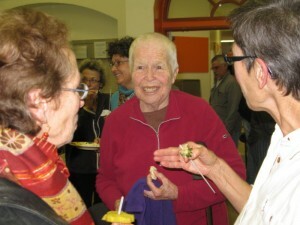 Her family was at the heart of the launching of the Bernal Heights Neighborhood Center(BHNC) in 1976, when she was a child. Her Grandmother Jean Hamer and mother Charlene Martinez were on the founding Board of Directors of the BHNC. Alberto Del Rio is a father of three, who grew up in his home at 565 Banks St. A strong but gentle and religious man, Alberto is an eloquent speaker on behalf of his family and other foreclosure fighters. Victor Granados is a tenant at 4207 Folsom St. with his wife and family. He is a quiet but determined fighter against his and other foreclosures. When Occupy Bernal needs guidance and inspiration, he often has words of wisdom. Ernesto Viscara is an owner and occupant of 249 Anderson, where he also rents to another family living on his 2nd floor. Ernesto has lived in Bernal for 30 years. He is also an accomplished public speaker, a veteran fighter for social justice and a participant in struggles against U.S. military intervention in Central America. Maria and Washington Davila are a quiet couple with two beloved Yorkshire Terriers, the Davilas have rented their home at 4255 Folsom St. for 7 years. They have been the ideal tenants, and the inside of their home looks like a photo shoot from Home Beautiful. Their landlord, who faces foreclosure, is ill and lives in Las Vegas. Archbishop Franzo King pastors the John Coltrane Church, located in the Western Addition community of San Francisco. He is a life-long resident of the Bayview-Hunters Point neighborhood. He has owned his house for over 20 years. He is a member of Alliance of Californians for Community Empowerment (ACCE). Eric Lundgren has lived in Bernal Heights for a long time and is active in Occupy Bernal. Ross Rhodes lives in the house he grew up in and is a lifelong resident of Bernal Heights. He heard about Occupy Bernal on a Monday, started working with Ed Donaldson with San Francisco Housing Development Corporation (SFHDC) on Wednesday, and by Thursday he was an active member of Occupy Bernal. Thomas German was born in Mobile, Alabama, a bit after New Year’s Day of 1940. After serving in the U.S. Navy, Thomas, aka “Tommie” or “German”, found employment as a die setter at the San Francisco Mint. He rented a home in Bernal in 1967. Living in the neighborhood for some years, he decided to purchase the home he was renting on Andover Street in 1974 for $21,000. How did he end up in foreclosure? He was facing a personal catastrophe. And he made a generous offer. So he refinanced his home. Although Thomas obtained and held insurance for his home, the insurance didn’t cover bringing the place up to code when a fire gutted the place in 2008. He invested in a family business that later failed and Thomas never recovered those funds. With the encouragement of loan personnel at Wachovia, Thomas borrowed on the equity everyone thought was in the value of the home. He signed a loan agreement for an adjustable rate mortgage (ARM) with a interest rate that increased over time because he thought he could surely repay the loan or refinance at a lower rate. His only income is a federal pension limiting his Social Security benefits, which are small. 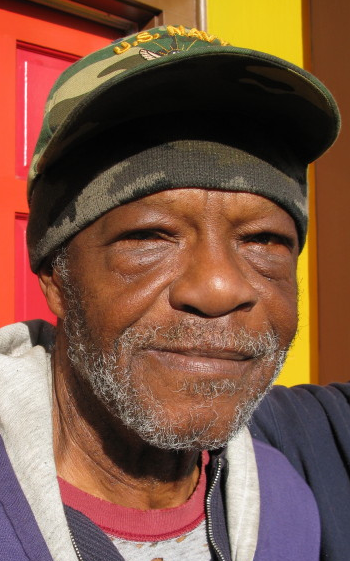 On his income, Thomas could no longer afford to make loan payments. By 2008, Thomas’ federal tax return noted home mortgage interest of $25,959 against taxable pension income of $31,3883 – paying the mortgage interest alone represented 81% of his taxable income! He joined the ranks of thousands suffering under predatory Wachovia home loans. Meanwhile, the very same day Congress passed the bailout plan that would award Wells Fargo a $25 billion dollar bailout from the taxpayers of the U.S. – the largest amount awarded in a single bailout payment – Wells Fargo announced it would reverse its prior decision and buy out Wachovia for $12.7 billion by the end of 2008, thus forming the nation’s second largest bank in terms of deposits. That same week, Treasury Secretary Henry Paulson issued a document revising the tax code to benefit some banks that buy other banks: a tax break worth up to $25 billion for Wells Fargo. Unlike Wells Fargo’s bailout success, Thomas applied twice for a loan modification under the Home Affordable Mortgage Program (HAMP) mandated by the U.S. Treasury as a response to the home mortgage loan crisis. Wachovia/Wells Fargo denied the loan modifications twice, once in June 2010 and again in November 2011. Nowadays, Thomas is struggling to find a way to stay in his home. He has filed bankruptcy to try to prevent foreclosure and eviction, but the outcome is uncertain. His neighbors here in Bernal have formed a support group to help Thomas stay in the neighborhood. Along with this community group, he is receiving assistance from a nonprofit counseling organization. We are committed to helping him defend his home against any foreclosure auction or eviction.